ASMA is an important step forward. With 2 years of consistent efforts by ASMA, I’m sure more and more academia will embrace social media platforms. 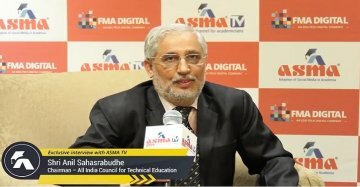 Watch this video in which Prof Anil Sahasrabudhe speaks candidly at #ASMA2018 about the need of ASMA (Adoption of Social Media in Academia) initiative, and how it can add value to the educational institutions and colleges. We are proud to have Prof Sahasrabudhe as our Chief Guest at the 2nd ASMA Annual Convention & Awards 2018 at The Leela Palace, Bangalore on August 31-September 1, 2018., which saw enthusiastic participation from 200+ thought leaders, influencers and change agents from the Academia, Government and Technology space.